The mother of the 18 year old found dead on Montreal's South Shore Monday says what happened in the hours before he disappeared is still not clear. 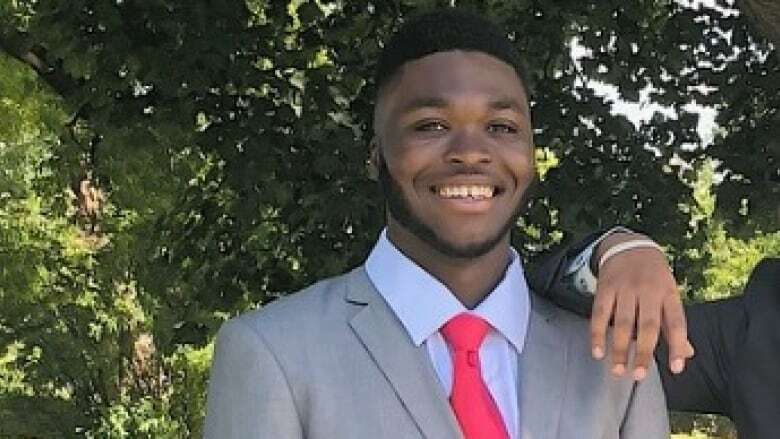 Collins Obiagboso left his Ottawa home to attend Montreal's Osheaga festival as part of his 18th birthday celebrations. What happened in between is still under investigation, but Obiagboso's mother says she's yet to hear a scenario that makes sense. "I think Collins just moved with the wrong crowd and he was the victim of circumstance," Georgina Mensa Boboe said while struggling to hold back tears. "Whatever it is that went wrong, we really don't know until police finish all the investigation." Obiagboso was last seen at around 7:30 p.m. on the festival's opening night. Travis Scott was slated to headline that evening and it was a show her son was looking forward to, Boboe told CBC's Daybreak. He didn't see the show and, by late Friday night, his friends were at a local police station asking for help locating Obiagboso. On Sunday, Montreal police opened a missing person file. His body was discovered on the South Shore Monday afternoon. Quebec's coroner is investigating. That evening, as Toronto rapper Nav performed on stage, Obiagboso's friends reported he was feeling overwhelmed and left the crowd. That was the last time they saw him. Sammuel said the friends' story has changed some since those first few days. "If somebody is changing the story every now and again, there's something wrong somewhere," she said, adding that Obiagboso, coming from a Christian family, was not the type to abuse intoxicating substances. Sammuel 's son, a longtime friend of Obiagboso, has started a GoFundMe page to help the family pay for funeral costs. Boboe is now waiting for the results of toxicology tests. She wonders if her son was "given something that was too strong for him." No matter what the results are, she hopes Obiagboso's memory won't be marred by the findings. She said it will not describe "who Collins was." One of the last text messages he sent to his mother read, "You are the best mom in the whole world." "He just did it out of the blue and I texted back. I said, 'You are the best son in the world,'" Boboe said. "Collins was a loving and caring and gentle and kind-hearted young man," Boboe said. "Whenever he is around, he warms up the whole place. I wish people could get to know him for who he really was." Boboe told CBC News that she wants to know more about the security Osheaga had in place. It was a new venue, she said, and the security "wasn't strong enough" to protect her son. A statement issued by Evenko said the company is "deeply saddened and our thoughts are with the entire family of this young man." The well-being and security of festival goers, it states, is Evenko's "number one priority." "Our security measures are in constant evolution to ensure they remain above the required standards towards major events."